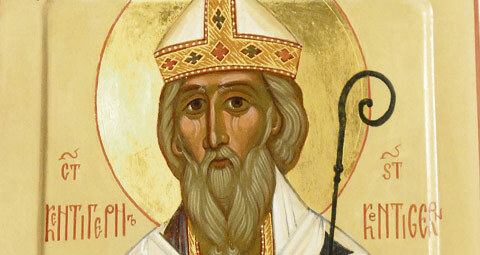 In Joceline’s Life of Saint Kentigern (also known as Saint Mungo) who lived in the latter half of the 6th century and is the Patron Saint of Glasgow, there is a fascinating account of Kentigern’s meeting up with Saint Dewi (also known as Saint David). It is a moving and insightful account of the way in which two Christian brothers (or sisters) can be soul-friends, can help each other in their Christian pilgrimage. I would like to go through the brief account of their time together and pull out some principles of soul-friendship from this. The first principle of soul-friendship is the mutual acknowledgement of the inherent value of the other and the desire to honour each other in the Lord. Each Christian is a much-beloved son or daughter of God and, as such, we must seek to appreciate each other and to value each other in the same way that God Himself values us. This is practically expressed in acts that honour the person. The second principle of soul-friendship is the mutual standing in worship before God. It is always God who is central in a soul-friendship. Out of this mutual standing in worship before God we find that there naturally emerges a holy conversation, a sharing of what we have received from God and this conversation is missional, it reaches out beyond the two friends and touches others with divine revelation that sparks faith and brings salvation. In one way, you might say that if God is the central concern of a soul-friendship, others are the secondary concern. It is almost as if the two friends are somewhat peripheral in their own relationship! The third principle of soul-friendship is that it is not merely mystical; it is also earthed and rooted in the realities of daily life. The two saints not only shared in worship and divine contemplation, they also helped each other in the complex organisation and practical arrangement of their ministries. The fourth principle of soul-friendship is mutual instruction in the faith and mutual exhortation in sanctity. Each of us has our own grasp of elements of the faith, grown out of the particular crucible of our experiences; therefore we always have things to share with each other, things to teach each other. We are all also “works in progress” when it comes to sanctity. We have our particular strengths and weaknesses. We can inspire and challenge each other to do better, to advance. Any genuine friendship desires the very best for the friend. In Christian terms this is expressed in loving encouragement and also exhortation. A man sharpens a man, as iron sharpens iron, says the Bible. The fifth principle of soul-friendship that we can draw from this meeting of Kentigern and Dewi is expressed in their parting, the principle of mutual benediction. This is the primary goal, our desire is that our friend might be blessed. Blessed in their walk with God, blessed in a deeper understanding of God’s will, blessed with a life that expresses closer harmony with holiness, blessed with a ministry that more clearly presents the love and call of God to men. The final principle of soul friendship is that it is a committed, continuing relationship. Although the two men parted, they did not cease to remember the other, to pray for the other and to be present to each other in their thoughts. Their relationship expresses the reality of the Universal Church, that it t say, all those who are in relation with God are by that same relationship also in relation with each other. If we have God as our Father, we have each other as our brother. This relationship, as t depends upon God is not limited by time or space. Soul friendship seeks to hold on to the reality of this mystical bond between believers. It will not allow a little thing like geography to interrupt their communion. It is appropriate that we learn these principles from the saint also known as “Mungo”, for this name signifies “beloved”. Who better to instruct us in how better to love one another in God?